All the info about the 2018 NRL Grand Final you need to know. 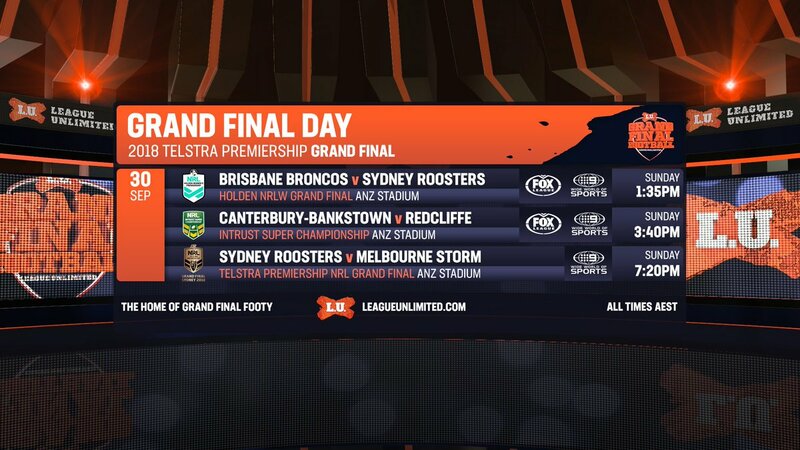 The Sydney Roosters and Melbourne Storm will fight it out for the ultimate prize - the 2018 NRL Telstra Premiership. Check out more information below on what to expect during the week and on Sunday at ANZ Stadium. Tribute to retiring players and a performance by Australian indie rock group Gang of Youths. All times listed are AEST - Australian Eastern Standard Time (NSW, QLD, VIC, ACT & TAS). Any remaining tickets for the event will be available via Ticketek if not sold out. The NRL's night of nights will take place at the Overseas Passenger Terminal in Sydney, with the Red Carpet Arrivals kicking off from 6:30pm, followed by the ceremony live on Fox League from 8:30pm. LeagueUnlimited.com will live blog the ceremony and bring you all the award winners on Wednesday evening. You can check out who won club best & fairest awards already presented here. Carbine Club of NSW will host the annual Grand Final Lunch with players and coaches from both the Roosters and Storm. A huge program of entertainment is set down at Moore Park's Entertainment Quarter on Thursday afternoon. On the site of the old Sydney Showground (next to the SCG), there will be plenty of opportunity to meet the players, get photos with the NRL trophy, club mascots, clinics and more. Check NRL.com for updated information regarding the event. The NRL Grand Final will be broadcast live and exclusively on the Nine Network in all states from 6:30pm AEST on Sunday 30 September. The NRLW and Intrust Super State Championship matches will be broadcast live on Nine in NSW, QLD, ACT & NT, while viewers in VIC, SA, WA & TAS will be able to catch the action live on 9Gem. Both these matches will also be broadcast live nationally on FOX League 502. Those in New Zealand will be able to watch all three matches on Sky Sport NZ. Radio listeners can catch the action on Triple M Sydney 104.9, 2GB 873AM or ABC Grandstand 702AM from midday Sunday.